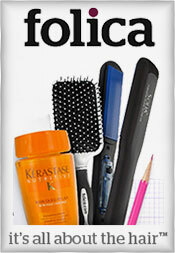 Since 1998, Folica has become the premier online destination for the best hair care and hair styling products available, bringing you a selection of the top flat irons, hair dryers and the best curling irons in the beauty biz that are guaranteed to give you the looks you want, for the price you want to pay. Folica hair tools - Folica is every woman's answer to a bad hair day, featuring a hair smoothing selection of professional hair styling tools and products that tame, control and transform every tendril. Take your pick from top flat irons including sought after ceramic and cordless flat iron models, to the best curling irons that all of the leading hair care professionals trust to achieve salon worthy looks without ever leaving the house. Top flat irons - Folica brings you a selection of the top flat irons in the professional hair care industry, with the same professional flat irons that the top hair stylists use. Choose from the best flat irons available from all of the leading brands including CHI irons, Sedu, Babybliss flat irons, Solia flat irons and more. From a mini flat iron that you can pop into your purse for smooth locks on the go to an Fhi flat iron that gets you runway ready in minutes, when it comes to the best flat irons online, Folica never falls flat. Fabulous hair dryers - Before you flat iron your hair with Folica's collection of top flat irons including Chi flat irons, Babybliss and Fhi models, you'll need a dry head of hair. Find a top selection of hair dryers that will perfectly prep your hair for straightening while keeping your locks healthy, shiny and manageable. Take your pick from a hot selection of ionic hair dryers, travel hair dryers, salon dryers, diffusers and other professional models from the leading brands featuring Sedu, CHI, Solano, Hot Tools, Conair and more! The Best curling irons - Create long-lasting curls with a professional collection of hair curling irons that spread heat gently and evenly with minimal stress to your hair. Choose from ceramic, brush, cordless, spiral, steam, travel or triple barrel curling irons that deliver consistent and dependable results, regardless of your particular hair type. Find the best curling irons available including CHI curling irons, Hot Tools irons, Babybliss curling irons and more. Hair care products - Besides featuring the best flat irons, blow dryers and curling irons online, Folica also brings you everything you need for overall hair maintenance. You'll find miracle working shampoos, conditioners, treatments, gels mousses, serums and wax, plus other hair essentials including brushes, clippers, shears, hair waivers, braiders and other glorifying hair products and tools that will help you achieve a magnificent mane. When it comes to hair care tools and products, you want the best of the best, which is why you shouldn't settle for anything less than the top flat irons, hair dryers, styling products and the best curling iron selection available. You'll never have a hair out of place when you discover the best flat irons and hair tools from Folica.